I am thankful for Duke basketball and my amazing Dear Husband, and I’m about to tell you how those two came together to make the best day ever. Duke basketball to me, though, means more than just the games. Sure, the games were amazing – I was lucky enough to be at Duke during the first two national championships (1991, 1992 – and now you know I’m old) and it was simply awesome. But Duke basketball means a lot more to me than that. Most importantly in my life, my engagement to Dear Husband centered around Duke basketball. That’s right. 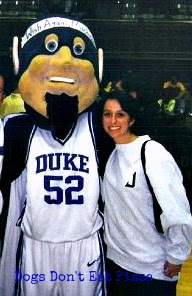 In 2000, Duke was going to play Michigan, my law school alma mater, in basketball, right before the holidays. I asked Dear Husband if we could go to the game, as my Christmas present. He agreed, and said that he would take care of the plane ticket and hotel if I could get the tickets. I am a member of the athletic booster club (no surprise there), so it made sense that I would take care of the tickets. We got to Durham on Friday before the Saturday game and still I had not been able to procure tickets. I’m not gonna lie – I was getting nervous about this. We got up on Saturday morning, had breakfast, and went to campus. Still no tickets. We walked around East Campus, which was where I lived my sophomore-senior years. Beautiful. We got to West Campus – that’s where the iconic and gorgeous Duke chapel is. We got to the steps of the chapel, and I’m plowing ahead to go in. Dear Husband stops on the chapel steps and says, “I love you.” I said, “I love you, too. Let’s go!” I thought we were just going to the chapel. He had other plans. He proposed right then and there. I was so stunned, I forgot to answer immediately! I did say yes (after he reminded me that I needed to actually answer him). Now, for those of you who don’t know or have been living in a cave for the last thirty years, Coach K is the long-time coach of the Duke basketball team. He has coached our Olympic basketball team more than once. He is an inspiration (more on that later). My amazing, fabulous, knows-I-am-a-huge-fan Dear Husband emailed Coach K about how he was going to propose to me, how I am a huge Duke fan and alum, and that we wanted to come to the game. Coach K’s assistant emailed him back and said that, if tickets were available, she would see what she could do. She had come through – on Friday, Dear Husband called her and tickets were ours. When we got to the game, we found our seats. They were FIVE ROWS BEHIND THE DUKE BENCH. We were sitting with the parents of players. It was, literally, the best seat in the house. Duke won, and, after the game, we got to meet some of the players and coaches. Oh, and the Blue Devil. Best day of my life. Ever. Never gonna beat it. So, Duke basketball has special meaning to me. But there are other reasons, too. Some of the best times at college centered around Duke basketball games – camping out for games together, watching with friends, bonfires (we burned benches – long story) after games. It says, “$2.99 buys you a net. 34-2 earns you one.” It was an ad that ran in the paper after Duke’s first national championship. I love it because it reminds me each day that nothing good is given to you; you have to earn it through hard work. After all, Coach K’s first couple of years at Duke were not so good, and several people thought he should be fired. Now he is one of the best coaches in the game, ever. I am grateful for Duke basketball because it gave me the best day of my life and several really, really amazing days, too. I am grateful that it allowed me to become closer to the good friends I had in college. And, as always, I am beyond grateful that I get to be married to Dear Husband, who is the best. *Dear Husband tells the story as that I didn’t actually say yes until he told me he had tickets. This is purely for entertainment purposes only. I assure you that I said yes before I knew about the tickets. Thank you! Dear Husband is the best. 🙂 Thanks again!